A few weeks ago, we gave you an update on our kitchen renovation. Today we will show you a part of our kitchen and the floor we choose. Before our renovation break, we started to think about the colors, materials en shapes that we wanted to use in our kitchen. As we are living on the countryside, we wanted to make our kitchen modern and clean but also with a classic country touch. At first we thought this was going to be done with an oak counter top, but after lots and lots of brainstorms with my husband ( yes we do this together ) we decided to go for green. 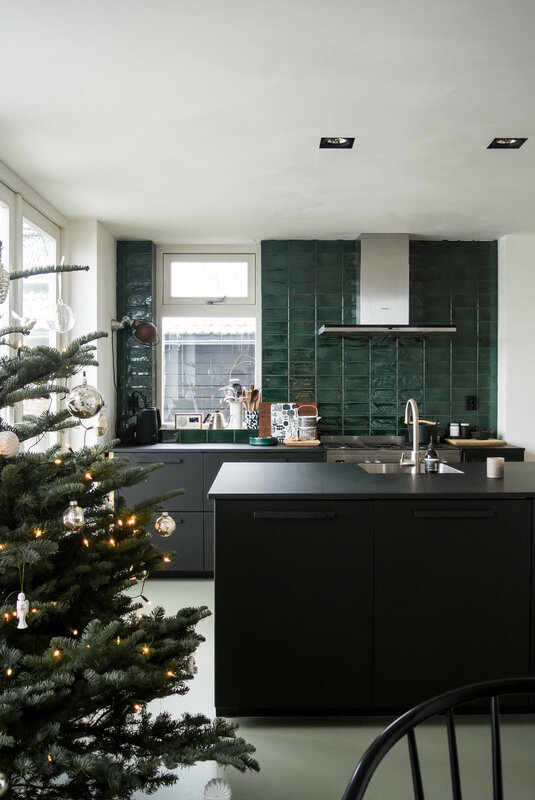 Dark green tiles and a rosemary green floor. The floor is a Marmoleum floor from Forbo. Forbo Marmoleum floors are associated with sustainability, durability, high quality and innovative design. It is made of 97% natural materials, of which 72% is retrievable and 43% is recycled content and CO2 neutral. Therefore the floor is one of the most environmentally friendly and durable floors which will last a lifetime. Something I can really appreciate. Also the material is antistatic, this attracts little dust and dirt. This makes Marmoleum an allergy-resistant floor that is easy to maintain. Which is great with our pet-family :) The floor also absorbs warmth from the environment, making it feel comfortable on bare feet. In addition, the floor is well suited for underfloor heating. We have this floor for several months now and we are very happy with the use of the material and especially very happy that we decided to go for a color. In the upcoming months we will continue our renovation project, with painting all the walls and the woodwork, which still has to be done and finishing our dining area with a search to for a dining table and lighting pieces. For now, we are really enjoying our new kitchen and we are looking forward to the upcoming holidays when we will be cooking a lot!